PepsiCo Design & Innovation team has introduced a new look for the Walkers core crisp range, designed in partnership with Vault49. The new design is said to ‘underline the rich brand story’ behind the UK crisps brand, while giving the packs a modern, premium feel. The Walkers logo has been moved to sit in the middle of pack, marking the point from which hand-crafted illustrations of British icons emerge. This includes the Liver Building in Liverpool, Big Ben in London, a red telephone box and a pigeon wearing John Lennon-style sunglasses. Each takes the form of a subtle Union Jack shape. Illustrations of tractors in a field reinforce the provenance of Walkers crisps, which are made with only British-grown potatoes. The rebrand is intended to help the packs stand out on shelf and strengthen the brand’s emotional connection with consumers. The new packs have been printed using flexo and also feature a mix of gloss and matte finishes, emphasizing the premium nature of the crisps and helping the design to pop on the shelf. 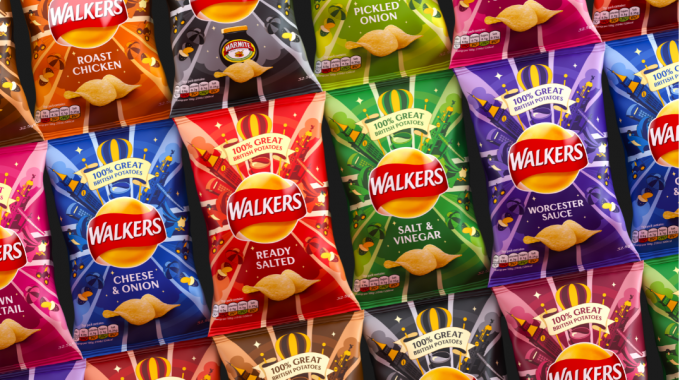 Jonathan Kenyon, co-founder and executive creative director at Vault49, said: ‘Walkers makes seven million packs of crisps every day and sells more than five times as many in the UK as its nearest rival. It’s one of those rare brands that taps into something deeper than the feelings people usually have for companies.